March 8, 2019 will see residents from all over Belize gather together at Hawksworth Bridge. Located in San Ignacio, this bridge is the launching point for the annual La Ruta Maya River Challenge. This year’s event is hosted by Belikin, and the endurance race will run a grueling four days. This isn’t a race that its participants take lightly. Succeeding in the race takes skill and perseverance, and teams of paddlers typically spend months preparing to tackle the 175 miles of river. Between the scorching heat and the dangerous rapids, the River Challenge is an epic test of endurance and courage. The La Ruta Maya River Challenge has a legacy in Belize. 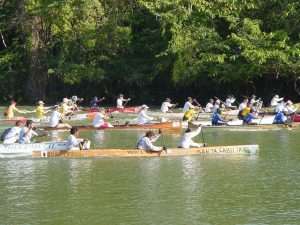 The competition first launched in 1995 as a way to raise money for cleaning the Belize River but quickly developed into a national institution, drawing hundreds of competitors from throughout Belize and around the world. But that commitment to environmentalism is still at the heart of the River Challenge. The ocean conservation group Oceana remains one of the event’s primary sponsors, and it receives further support from Belize’s tourism industry. The event now serves as a way of raising money for environmental concerns, promoting awareness of ecological threats, and celebrating the resilience and heritage of the Belizean people. No one who’s ever seen the race would question the commitment of its competitors. The three member canoe teams arrive at the bridge at seven in the morning and have to carry their canoes physically over short distances and also contend with the brutal Belizean heat and dangerous rapids. While many businesses sponsor canoes of their own, it’s an event open to both professionals and amateurs. But above all else, the La Ruta Maya River Challenge is a celebration. Even for those who have no intention of boarding a canoe, there’s plenty of music, food, games, and prizes to enjoy. If you’re looking to follow the entirety of the race, let Barefoot Rentals and Services help you rent a vehicle. We also offer a range of tours that span everything from Mayan sites and caves to the Belize barrier reef. For those who want to immerse themselves in the natural beauty and culture of Belize, there’s no better choice than Barefoot.